As lazy as I can sometimes get with my skincare routine, one product I always use is moisturizer. It’s a common misconception that only people with dry skin need to moisturize – even if your skin is oily, you still need moisturizer! Meet the most truthful cosmetic brand that is formulated with superior ingredients and efficacy in the safest and most honest way possible. belif delivers remarkable value to the skin by applying rich tradition and in-depth knowledge of natural ingredients. True quality. True benefit. I think it’s quite cute how they are very upfront with labelling themselves as ‘the most truthful cosmetic brand’, and definitely a testament of commitment to delivering on their claims and promises. 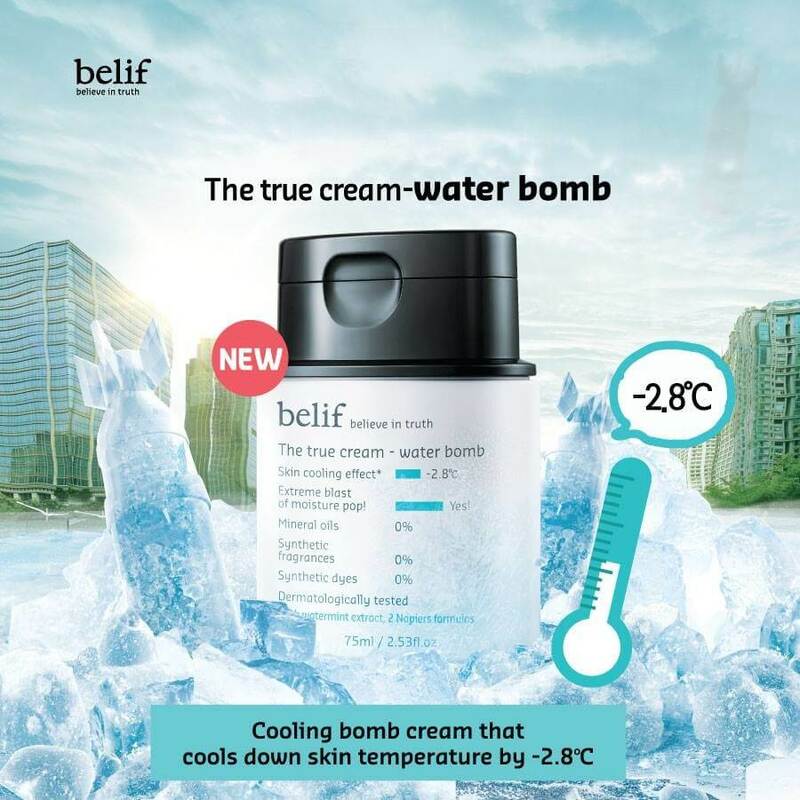 I was given a sample/travel size of this water bomb after I purchased some items from TFS (yes, they’re under the same parent company). Malachite: Neutralizes free radical activity. Oat Husk: Attracts moisture.Water, Dipropylene Glycol, Glycerin, Methl Trimethicone, Alcohol Denat, Dimethicone, Cyclopentasiloxane, 1,2-Hexanediol, Malakite Extract, Caprylic/Capric Triglyceride, Pentaerythrityl Tetraethylhexanoate, PEG/PPG/Polybutylene Glycol-8/5/3 Glycerin, Alchemilla Vulgaris Leaf Extract*, Equisetum Arvense Leaf Extract*, Stellaria Media (Chickweed) Extract*, Urtica Dioica (Nettle) Leaf Extract*, Plantago Lanceolata Leaf Extract*, Avena Sativa (Oat) Kernel Extract**, Calendula Officinalis Flower Extract**, Nepeta Cataria Extract**, Rubus Idaeus (Raspberry) Leaf Extract**, Baptisia Tinctoria Root Extract**, Dimethiconol, Polymethylsilsesquioxane, Sodium Acrylate/Acryloyldimethyltaurate/Dimethylacrylamide Crosspolymer, Isohexadecane, Polysorbate 60, Ceramide 3, Cholesterol, Butyrospermum Parkii (Shea) Butter, Phenl Trimethicone, Pentaerythrityl Tetraisostearate, Panthenol, Squalane, Triethylhexanoin, Macadamia Ternifolia Seed Oil, PEG-150, PEG-40 Hydrogenated Castor Oil, Acrylates/C10-30 Alkyl Acrylate Crosspolymer, C14-22 Alcohols, Arachidyl Glucoside, Hydrogenated Lecithin, PEG-100 Stearate, Stearic Acid, Glyceryl Stearate, Carbomer, Tromethamine, Trisodium EDTA, Fragrance+, Citronellol, Limonene, Citral, Geraniol, Linalool. *Napiers aqua formula. **Napiers original formula. +Fragrances of natural origin. According to Sephora, this product is dermatologist tested and free of mineral oils, petrolatum, synthetic preservatives, dyes, fragrances, and animal origin ingredients. Does it live up to its promise of using ‘the purest of ingredients’? Definitely! Packaging: The sample/travel size packaging is different from the full-sized version, but is generally still very simple and easy to use. I really like how it directly states its functions and effects on the skin – easy to read, and straight to the point. It’s also easy to squeeze out an appropriate amount of product. Texture: If you have oily/combination skin, you will love this. It feels so thin and lightweight that you would be forgiven for thinking this was water repackaged into a tube. It’s easily absorbed by the skin, doesn’t feel the slightest bit thick, oily or uncomfortable. Effectiveness: Clinical tests have proven that this moisturizer provides a +70% increase in skin’s hydration levels. While I don’t have any special equipment to test this claim, I can testify that it isn’t as far-fetched as it sounds. Upon application, your skin immediately feels cooled, as though you have applied cold water on your face. It’s nothing to do with the environment temperature, but rather the formula and ingredients in the moisturizer. There is also an instant burst of hydration once it is absorbed by the skin – that’s why it’s aptly named ‘water bomb’. Thanks to this moisturizer, I found my skin feeling less taut and dry even after sitting in air-conditioned rooms for long hours. It also doesn’t get too oily by mid-day, nor does it clog my pores. I’ve had absolutely no breakout problems while using this product, which is great for people with sensitive and acne-prone skin just like mine. If anything, my skin was at its best when I used this both in the day and at night. If it wasn’t for the price, I would have bought tons of this and stockpiled them at home for me to use forever and ever. I’m honestly very hesitant about spending so much money on just one moisturizer. SGD60 is really no small sum. I know it’s ironic, given that I have less qualms about buying so many lipsticks, but somehow it just doesn’t feel as convincing to spend a bomb (lol) on a moisturizer. I’m still contemplating whether to buy this after I’ve finished my other moisturizers, but if you are willing to invest in a good moisturizing product that definitely shows results for all skin types, this is the one you have to buy. I love this product to bits, and I can honestly justify the price when I take into account factors such as the natural ingredients and great formula. Have you tried the Nutrogena Hydro Boost? I use that one day and night and it is very similar! In my admittedly limited exploration of skincare recently, Belif has been my favorite moisturizer, I completely agree with your assessment. I also agree with the expense. I hope I continue to get some samples, and I’ll grab some when I’ve got the cash for it, but the price is difficult to handle.